India was not on my list of places to go in 2016. But, when I heard that it was the destination for the next American Birding Association Safari, and when I found out that many of my friends from the incredible ABA South Africa Safari were participating, as well as ABA hosts Jeff Gordon, Liz Deluna Gordon, and George Armistead, and that the trip was once again being coordinated by Rockjumper Birding, and that Rockjumper chief honcho Adam Riley (also a 10,000 Birds family member) would be one of the guides, it was hard to say no. 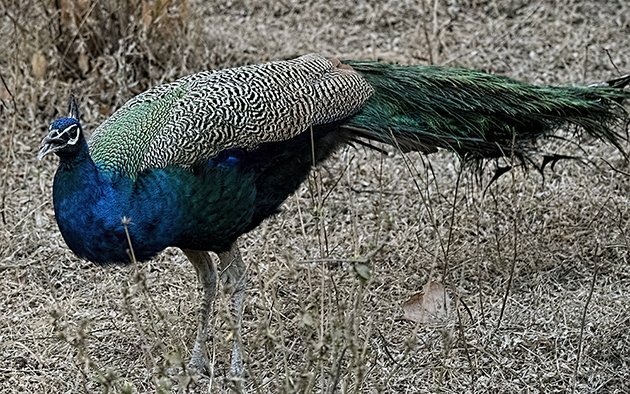 So, I birded India, land of Indian Peafowl, Saag Paneer (my favorite Indian dish) and Tigers. The Taj Mahal stands dreamlike on the bank of the Yamuna River, approached through an entry gate that allows a view of its perfect symmetry. A few seconds to stare and take a photograph before being run over by breathless tourists in search of the perfect Taj selfie. We all participated in the photo party, I admit, plain old tourists for a few minutes. Then, we became birders again, noting Common Mynas and Eastern Cattle Egrets on the terraced lawns, Yellow-footed Pigeons, European-collared and Red-collared Doves in the trees bordering the garden squares. 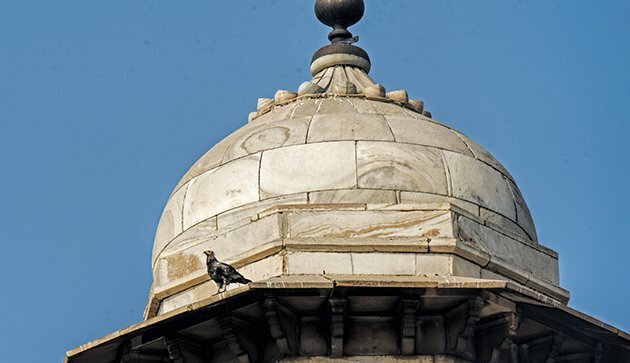 Black Kites, ubiquitous throughout Old and New Delhi, were a presence here too, as were Egyptian Vultures, landing and taking off from the domes of the mosque located west of the main building. Rose-ringed Parakeets, another incredibly common bird, flitted and squawked up and down marble walls of the Taj, oblivious to its history as a mausoleum built by the Mughal emperor Shah Jahanin in the mid-17th century to honor his favorite wife, Mumtaz Mahal (she died after giving birth to their 14th child). 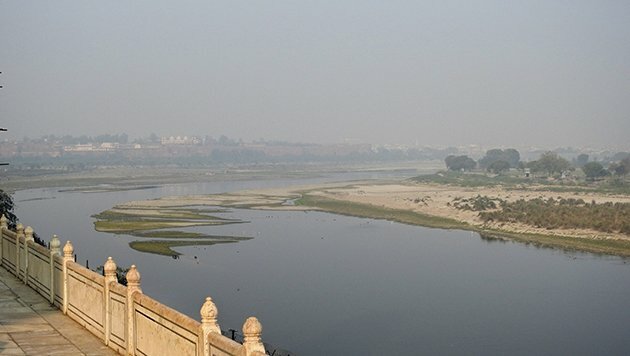 Once we donned our booties and took the brief tour of the tomb, we climbed up to a terrace overlooking the Yamuna River and started birding in earnest. 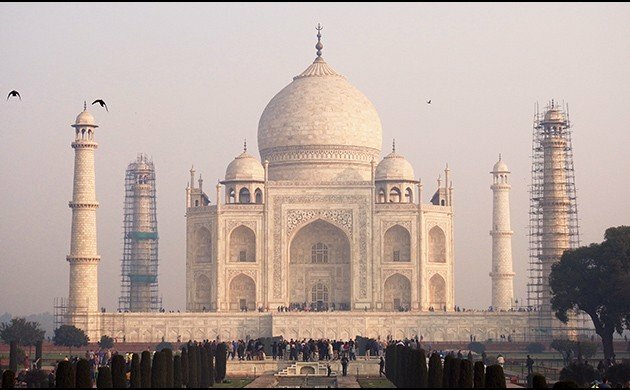 Scopes, like shoes, are not allowed in the Taj Mahal, but that didn’t stop us. We still had our bins and our eyes and our patient guides. Rockjumper leaders Glen Valentine and Cuan Rush helped us identify the familiar and unfamiliar on the Yamuna shores (mostly the far shore, of course): Bar-headed Goose, Painted Stork, Eurasian Spoonbill, Black-headed Ibis, Black-winged Stilt, two Pied Avocets (this was a good sighting, stilts were plentiful, but we had yet to see an avocet), a juvenile Caspian Gull. Shorebirds included Ruff, Common Sandpiper, Common Greenshank, and Common Redshank. Great Cormorants spread their wings; Ruddy Shelduck swam out in small groups to the middle of the river and then back to the far shore. Soon, it was time to leave the Taj Mahal. 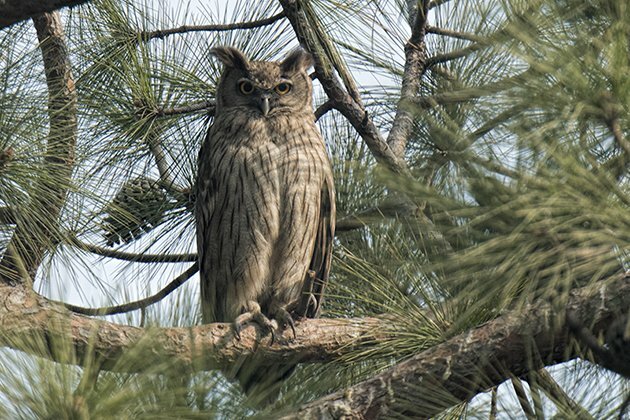 I was waiting at the entrance gate for everyone in our group to gather, when I remembered that someone had told me about nesting owls at the Taj. Luckily, I didn’t have to look hard to find the Dusky Eagle-Owl’s nest. A few birders were already there (when in doubt, follow the bins), and it was located nearby, east of the gate. The nest itself was buried deep in the tree, but one of the parents standing guard (very high up, I should add) accepted our admiration with the usual owl nonchalance. 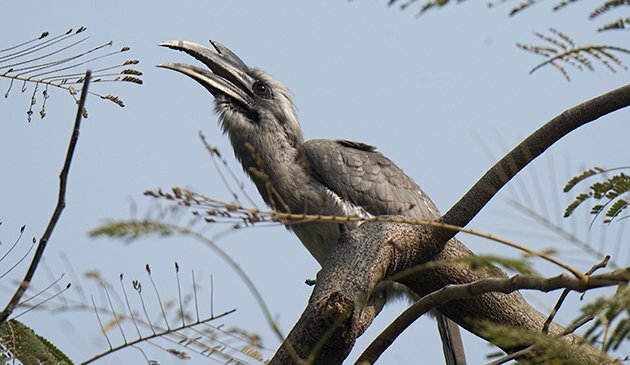 I also had just enough time to view the Indian Grey Hornbill in the tree next-door. For most of the birders in our group, visiting the Taj Mahal was the fulfillment of a bucket list experience, and they left feeling ecstatic over its beauty. I left feeling ecstatic over observing the birds. Yes, the Taj is exquisitely designed and constructed, but to me it felt too pristine, too un-lived in. I preferred Fatehpur Sikri, a 16th-century palace city we toured later in the day. Fatehpur Sikri once housed the Emperor Akbar and his harem of 5,000 women. Today you can see Indian Chats, White Wagtails, and Rose-ringed Parakeets (they’re everywhere) amongst the red sandstone ruins. I enjoyed walking around, wondering what birds those 5,000 women had seen in the 1580’s, wondering if they were allowed to see them. 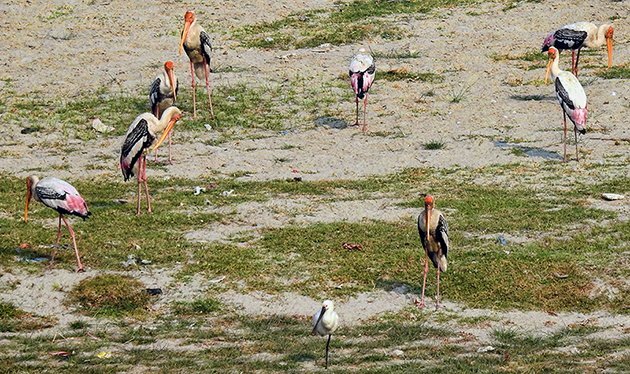 The day trip to Agra was part of our time in Bharatpur; when we weren’t birding the Taj Mahal, we were birding Keoladeo National Park or the dam area of Bund Baretha. 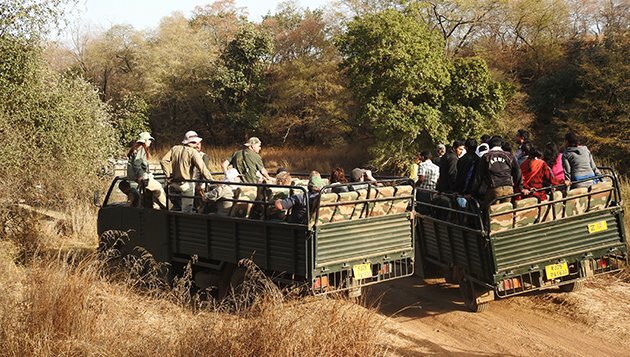 We then traveled to the district of Sawai Madhopur for the second part of the ABA Safari. 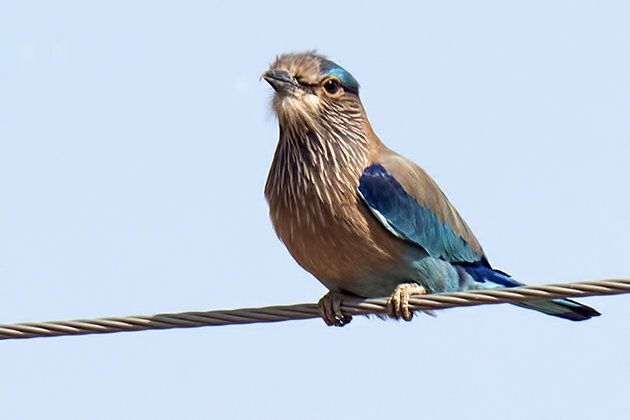 An Indian Roller greeted us from a wire over the dirt road to our hotel. Lunch, some time to get to know our rooms (I loved mine, right next to a tree that housed a Spotted Owlet), and we were off again for Ranthambhore National Park, right down the road. Target: Tigers. 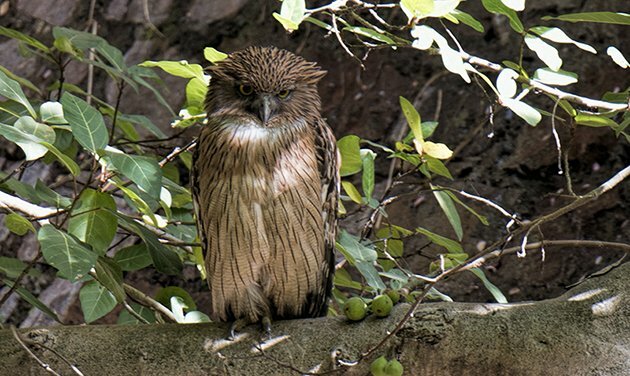 My group, led by Rockjumper guide David Erterius, started off with a great view of this Brown Fish-Owl, perched on a low wall in a thicket of vines near the entrance to our route. The species is crepuscular and nocturnal, but can sometimes be seen during the day. It was a big owl. Well, the Dusky Eagle-Owl was big too, but for some reason, the Fish-Owl seemed huge. Maybe it was the intimidating stare. 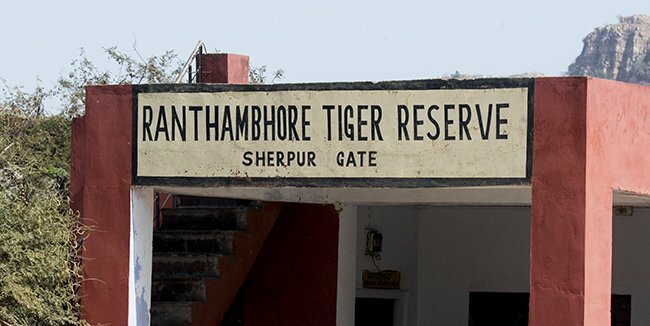 Our local Ranthambhore guide told us that a tiger had been located on our route. We drove there directly after the Brown Fish-Owl, no stopping for Lesser Flamebacks or White-browed Fantails. And this is what we saw. From a long distance away. Blocked by gypsies (open jeeps) and canters (larger open-air vehicles). Because, this is what people do in Ranthambhore NP. They look for tigers. And, although the number of gypsies and canters is limited most days, more vehicles are allowed on weekends. And, this was Saturday. 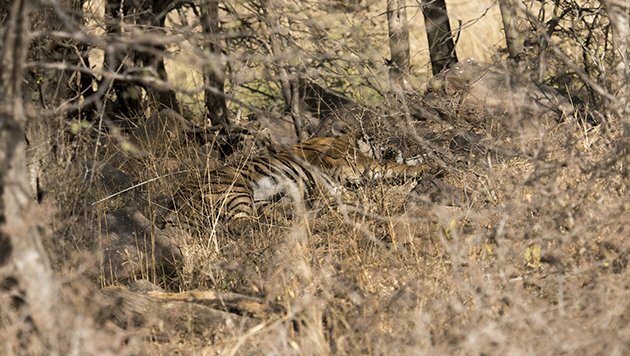 But, life can be kind, and after getting stuck between two rocks and then, getting unstuck, repositioning the vehicle on the other side of the prostrate tiger (who seemed oblivious to the silly humans), we got a clear view and the tiger decided his nap was over. Here is the first of the three tigers I saw at Ranthambhore. 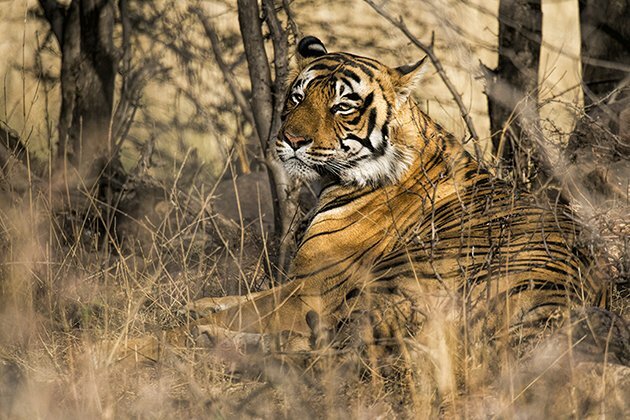 A well-traveled person who visited Ranthambhore years earlier (alright, my sister) told me that there was no guarantee I’d see a tiger. Routes are assigned to vehicles, some routes are better than others, and even on the best routes, the beast will be elusive. This may all be true, but, that afternoon, every member of the ABA Safari, birders in all five groups, saw a Bengal Tiger. Rockjumper guides (have I left anyone out? Oh, yes, Forrest Rowland was particularly jubilant) and ABA hosts Jeff, Liz and George breathed deep sighs of relief. Dinner was a celebratory event. I can’t sign off on this post without thanking the ABA and Rockjumper (including our local guides, drivers, and Sarah and Alison in the office) for organizing a wonderful trip filled with life birds, life mammals, a few life spiders (and one life leech, but that’s part of the Assam story, which may be told in a future post). And, I need to wave hello to my fellow and sister birders, with whom I had so much fun. 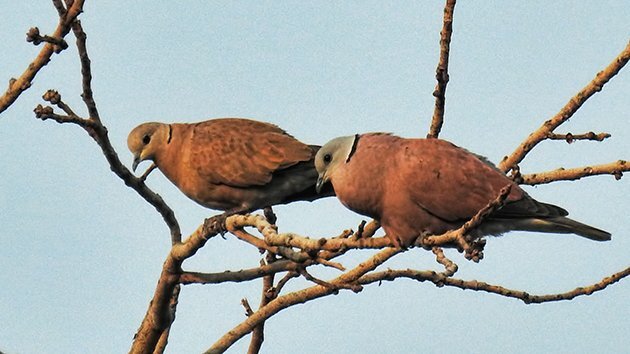 I had not planned on birding India in 2016, but I’m very happy I did. Owls and tigers and Taj Majal! Oh my! My goodness, what an incredible trip! More tigers and more owls please. Tigers are awesome, I saw one at Sariska. Sadly I lost all my notebooks from that trip, but I did see Indian Eagle Owl, Egyptian Vulture and Jungle Cat too. I was equally impressed by the gatehouse, but nobody shows the photographs of that! They stand at the gatehouse and photograph the Taj Mahal! It is a distant childhood memory for me! 14 pregnancies? Gosh, she certainly deserved the monument! Looking at your tiger photos… I should invest in a better camera. Or finally learn how to use this one. Or both.